As noted in John Buscher's welcome letter, the Illinois State Society of Washington, DC has its roots in the Illinois Democratic Club of Washington City founded in 1854. For both social and political reasons, government clerks from Illinois formed a social club in Washington to help each other. Without any hint of irony, many members joined the Illinois Republican Club when Abe Lincoln came into office. Government clerks were not yet covered by Civil Service protections and it always seemed like a good policy to adopt the name of the party in the White House. Many of the state clubs followed this practice, not just Illinois. The club has operated almost without interruption from 1867, when it was called the Illinois State Association, until the present time. It was renamed the nonpartisan Illinois State Society of Washington, DC in 1917 just before America declared war on Germany. For more information about The Illinois State Society of Washington, DC, visit our general information web site at www.IllinoisStateSociety.org or call our ISS HOTLINE at 703-461-3610. In this article, I would like to highlight one famous American who was an early visitor to an Illinois club event. He was our neighbor from Missouri and the great humorist Mark Twain. Mark Twain was only 32 years old on the night of Thursday, February 20, 1868 when he was invited to attend a reception of the Illinois State Association (which was the 19th Century name of the Illinois State Society). The reception was probably at The Willard Hotel. On that night, Mark Twain was a newspaper columnist and humorist who was just starting to get famous in the years after the Civil War. 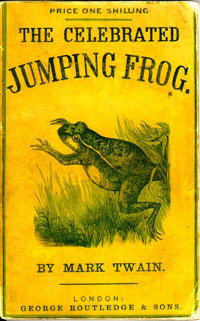 Just the year before this party in 1867, Mark had published his first book, The Celebrated Jumping Frog of Calaveras County. He loved to write about Missouri and Illinois towns along both sides of his beloved Mississippi River. But his world fame as the author of books about Tom Sawyer and Huck Finn was still off many years in the future. It will help the reader to understand Mark Twain's references if you note the fact that this reception took place during the impeachment hearings for President Andrew Johnson in the House. There is a reference to an annoying conversation with a member of Congress at the party who believes his country is in danger due to the hearings. 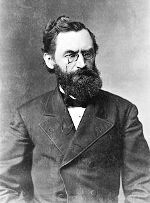 The impeachment manager was a member of the Illinois State Association, Congressman John A. Logan, a former Union General and also a former Democrat and now Republican from Murphysboro, Illinois. Logan that same year founded Memorial Day when his capacity as Commander of The Grand Army of the Republic (GAR) Union veterans organization, he issued General Order Number 6 to call for the display of flowers at graves north and south. The GAR was founded in DeCatur, Illinois the previous year. Twain's article below was published in The Chicago Republican on March 1, 1868 and presumably in other newspapers as well. It is a humorous look at the Illinois State Association party which he praises as most "agreeable" and "a very socialbe company for a stranger to fall among", so much so that "I shortly became a contented Illinoisan." He Attends the Illinois Association Reception. An Agreeable Gathering -- The Skeleton of the Feast. Mark's View of the Impeachment Proceedings. A Lion Aroused -- Gideon on the War Path -- Make way for Welles and the Marines. "Flame, Fire and Flame" -- Fury by Telegraph. I refer to the reception given by the "Illinois State Association," yesterday evening. Or, rather, it was more a "reunion," with considerable "at home" in it than the funereal high comedy they call a "reception in Washington." Col. Chester and his fair daughters -- former citizens of Chicago -- conducted the honors, and performed the onerous task with a skill and address that placed even diffident strangers at their ease; insomuch that I shortly became a contented Illinoisan without knowing just how or where the change took place. The invitation I had received was couched in such mysterious terms that I gathered from it a vague notion that I was going there to report a sort of State Agricultural Society; and it was a very agreeable surprise to find a large party of gentlemen present who were not talking about steam plows and corn-shellers, and a brilliant company of ladies who were taking no thought of prize turnips and miraculous cabbages. I like agriculture well enough, but not agricultural mass meetings. There is nothing about them that fires the blood. At some of the receptions here, the people move in solemn procession up and down the drawing-rooms, bearing an imaginary Ark of the Covenant, and looking as if they knew they had to wander forty years in the wilderness, yet; but there was nothing of this kind last night -- no processions, no solemnity, no frozen ceremony. The throng shifted constantly and talked incessantly. Nothing could be less stately or more agreeable. It was a very sociable company for a stranger to fall among. Finally, I found a petite young lady (I don't know what petite means, but it is a good word) right from my own side of the river, and then I felt more at home than ever, if possible. She was from Dubuque, which is on the California side of the Mississippi river, and so, of course, we were, in a manner, neighbors. A constructive old-acquaintance ship like this, is wonderfully fortifying and reassuring, when one is in the midst of a foreign element, even though that element is disposed to be a generous and a friendly one. "It has been a very fine day, sir." "Sir, what the weather may be, or what the weather may not be, concerns not me, when my country is in danger." "Well -- I am sorry I made such a thoughtless remark. I meant no harm -- I did not notice what I was saying. People cannot be too careful what they say, when the country is in danger. But the weather you know --"
"Sir, what signify the vagaries of the weather, when revolution stares us in the face! when the muttered thunders of coming disaster startle the ear! when dark forebodings visit our thoughts by day, and wrathful carnage crimsons our visions of the night!" "True -- I had not looked at it in that light. I slipped up on the carnage, so to speak. Under circumstances like these, I know, as well as any man knows, that it is little less than treason to speak of the weather --"
"Treason! Ha-ha! Treason is feeding at the very vitals of the land! It stalks unrebuked through the corridors of the nation's capitol! It sits in the high places of the Commonwealth; its flings its gaunt shadow athwart the very threshold of the fane of liberty ! Sir, prophetic voices sound in my ears, and lo, they chant the requiem of the great Republic! It's doom is sealed!" "Well, I know you will pardon me, sir. I didn't know it was as bad as that, or I swear I never would have mentioned the weather." I think this old sepulchre was a member of Congress, but I did not catch his name distinctly. But why do such people go to social gatherings, and practice their execrable speeches on unoffending strangers? Why do they go around saving the country all the time, and snubbing the weather ? Why do not they do like Garret Davis, and persecute Congress, which is paid to be persecuted? These harmless lunatics only distress the guests at an evening party, without absolutely scaring them. I would be ashamed to act so poor a part as that. If I had to be a lunatic, I do think I would have self-respect enough to be a dangerous one. I hate that solemn-visaged body-snatcher now, and if he is a Congressman I shall always try to find out all the mean things I can that other people do, and put them in print and attribute them to him. I think that will make him wince. The idea of a Congressman bowing condescendingly to one of the people! We cannot put up with that. I long to report one of that man's speeches, and garble it so that his constituents will think he has forsaken his political principles and gone over to the enemy. I have digressed somewhat, and now return to the subject only to say that this Illinoisan reunion was lively, void of restraint, and eminently pleasant. This is the most agreeable way in which Senators and Representatives can meet their fitting constituents, and the idea is well worthy of adoption by the representatives of other States here. Americans are not by nature, inclination, or home teaching, courtly enough to enjoy the formal humbuggery of an orthodox "reception." I have made the above notes the present time, because it was most convenient to do it now -- the remainder of this letter will be written a week hence. I had a list of all the Illinoisans present at the party, but I cannot furnish it now. The degraded, black-hearted chambermaid has kindled the fire with it, of course. If there is on earth a race of miscreants I hate with an undying hatred, it is chambermaids. If there is any dissipation I enjoy with all my heart, it is to attend their funerals.